← There is “A Whole Lot A Happening” in the Central District of the FSA!! Pam Makes Her Hammer!Pam Nurnberger, Past First Lady of the Southwest Coast District as her husband Ron served three years as District President, earned her 200th State Point last Tuesday at FL P-19 at Lakeland Shuffle Club. She graciously consented to an interview with this columnist, who can affirm her modest demeanor. She explained that she was born in a VERY small town, Custer, MI, which she supposes has about 890 residents now. My research uncovered 237 residents in the 1940 US Census, compared to 143 in Gessie, IN where I was raised. Anyhow, she credits her mother with helping her have a happy life which happiness continues to the present, even despite the fact that her Daddy lost his life in an accident caused by a drunken driver hitting his car. Pam was a cheerleader because no girl sports were permitted in those years. Her brother was a star in baseball and basketball. Pam even took notes on Detroit Tigers games broadcast on TV as a favor to her brother when he lacked the leisure time to watch. After one year of business college, Pam worked 26 years as a school secretary in Custer, MI. Her family is important to her. Her daughter was All State in 3 sports, and her son played baseball like his uncle. Pam has 2 children, 3 grandchildren plus three step-children and 5 step-grandchildren. 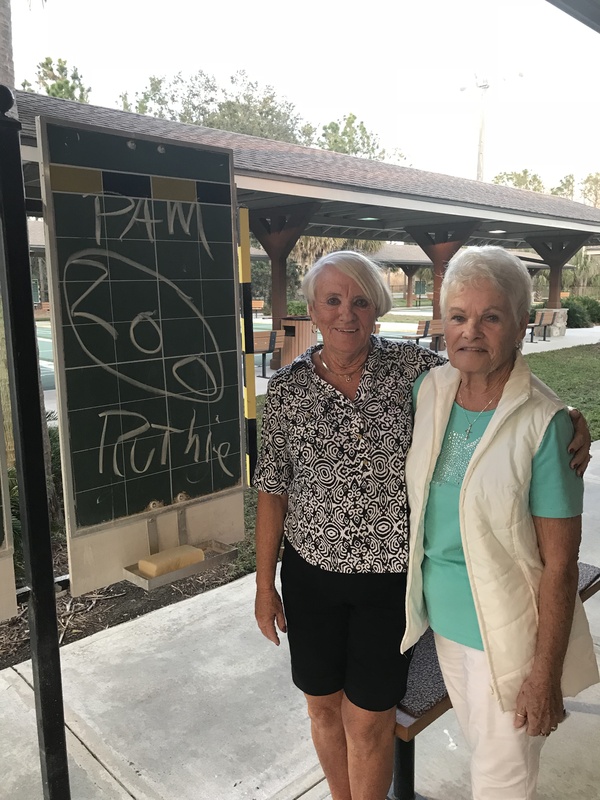 Pam and Ron have been married since 2005, retiring in 2009 and coming to SeaBreeze where Kay Thorenson and Charlie and Letha DeVries gave her lessons in shuffleboard. Charlie convinced Pam to try tournaments downtown in 2011. Setting a goal of winning the Southwest Coast District Amateur Masters in 2011, she succeeded. Letha convinced her to play at Port Charlotte and they placed in the Upper Division, but she declined Instant Pro because of partners who would be let down that season. She then made enough points to become Pro beginning Oct. 1, 2013. Pam then set a goal to win the District Open Masters in 2014, which did happen. She has won a State Masters or two and played in several already. She has become eligible for the Florida Hall of Fame in only 5 years as a Pro (It took me 10 years, myself). Instead of announcing her pride, she wants to thank all her great partners who helped her get those 200 points. She states that she loves the game, loves the shuffleboard “family,” loves Ron and all their offspring. Ron, ever the family jester, hints that he hopes she can do everything as well as she shuffles! I join her many friends in congratulating her for her accomplishments. FL P-19 at Lakeland, Feb. 5, State-Sponsored M/L Doubles, 75 points. Ladies Main: 2. Pam Nurnberger and partner. SWCD D-16 Feb. 8 at Bradenton, Open M/L Doubles, 75 points. Ladies Main: 1. Terri Smith-Marilyn Everett, 2. Arlene McCague-Shirley McCullough, 3. Cindy Slaughterbeck-Pam Nurnberger, 4. Erika Berg-Linda Wallingford. Consolation: 1. Marlene Coburn-Lois Wegner, 2. Heather Godson-Eva Mae Lake, 3. Flo Kowalewski-Siggy Gudzus, 4. Jill DeBruyne-Elaine Antaya. Men Main: 1. Hank Hoekstra-Jean Wilson, Jr., 2. John Roberson-Phil Booher, 3. Grant Childerhose-Murray Potter, 4. Jim Miller-Clarence Gingerich. Consolation: 1. Patrick Antaya-Elmer Heisler, 2. Bob Grissom-Bob Kendall, 3. John Mickle-Joe Kent, 4. Ben Coy-Al Kaleel. SWCD A-13, Feb. 9 at Bradenton, Draw Any Amateurs/Any Doubles, 16 frames/75 points. Main: 1. Jim Clark-Ursula Joyal, 2. Don Trottier-Mary Federation, 3. Frank Marderosian-Maurice Joyal, 4. Charles Stannard-Dave Williams. Consolation: 1. Bill Bierema-Tony Souza, 2. Ron Timmerman-Mike Collins, 3. Kathy Laver-Martha Kaufman, 4. Cheri Wargo-Sandra Kolasinski. Today Feb.13 is the second day of FL P-20A at Golf Lakes, P-20B at Leesburg, M/L, 75 points. Also today Feb 13 FL A-18 (Starts Tuesday) at Golf Lakes, Any Amateurs/Any Doubles, 75 points. Thursday, Feb. 15 at Bradenton, SWCD D-17, No 2 Pros, M/L Doubles, 75 points. Any Amateur is eligible to play in this tournament, two Amateurs could play together. No separate Amateur tournament this week. Next Monday Feb. 19 FL P-21A at Trailer Estates, DeSoto Doubles, M/L , 75 points, P-21B at Melbourne Tropical Haven. Also Next Monday, Feb. 19 FL A-19A at Sebring, A-19B at Leesburg, Any Ams/Any Doubles, 75 points.